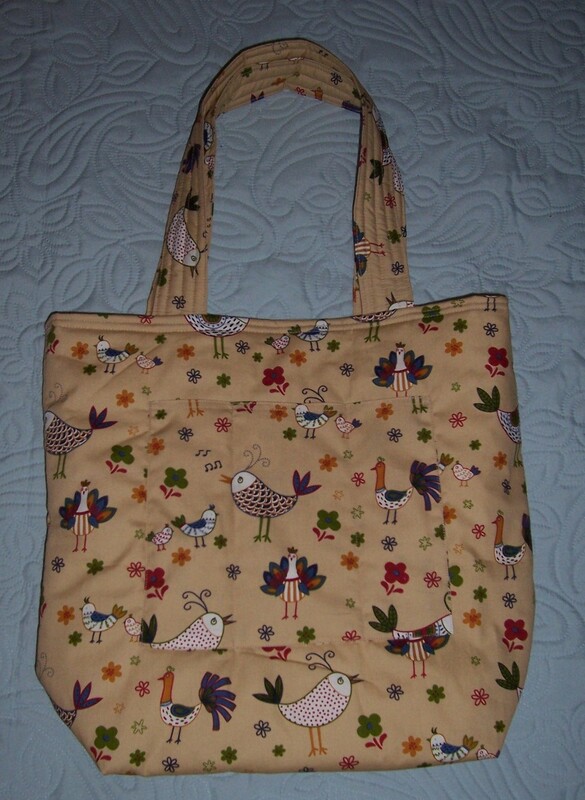 As I have not been able to spend as much time as I would like in the Sewing Room, I have instead been stitching of a different type. 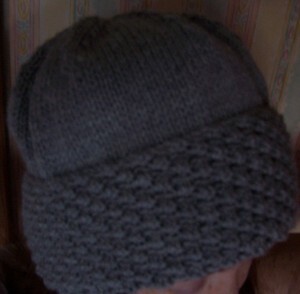 I learnt to knit way back in the late 50’s when I wanted to make a bonnet for my new baby sister. I remember that the yarn was yellow and scratchy, the knitting needles plastic. Whatever happened to that bonnet I don’t know but it certainly never made it to adorn my sister’s head! Inspired by Sian of Kittenish Behaviour, I wanted a short cropped-style cardigan to wear over my full-skirted dresses. 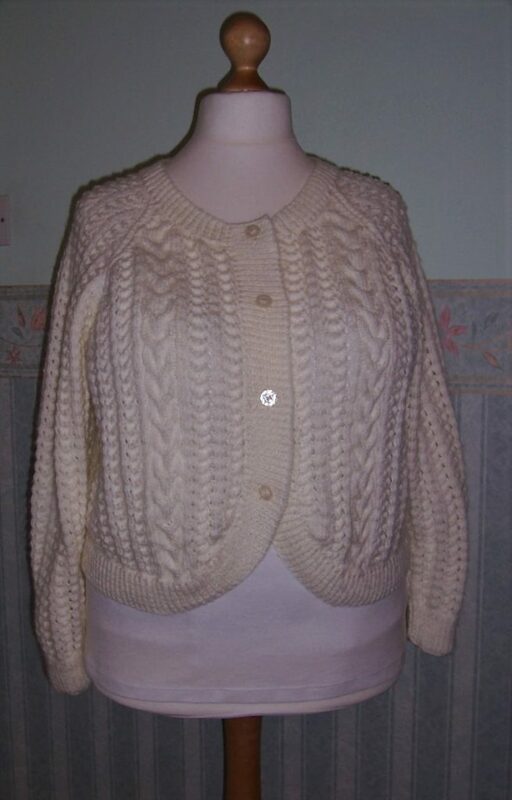 Having made several Aran sweaters and cardigans over the years I enjoy any form of cable knitting. This pattern combines the two requirements of length and interesting texture using my favourite Double Knitting yarn. The yarn that I used is Hayfield Bonus DK which is 100% acrylic, machine washable and can also be tumble dried. 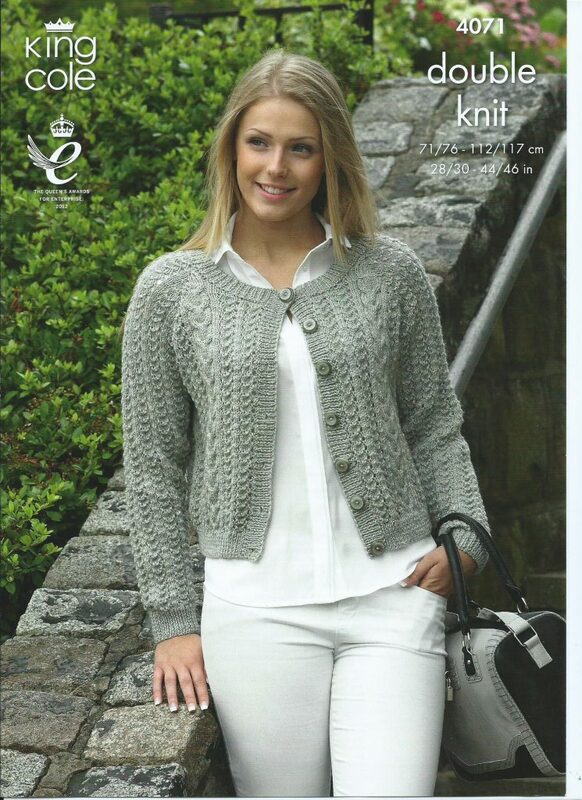 The washing instructions were important for me as using a Light Cream yarn I knew that the cardigan would show every little mark and I am rather a ‘dirty’ knitter! I made the largest size which calls for 13 x 50 grm balls of yarn. I purchased 7 balls of 100 grms as the last thing I wanted was to run out of yarn. As it turned out there was no fear of that as I have 1½ balls of yarn leftover which I can use for another project. 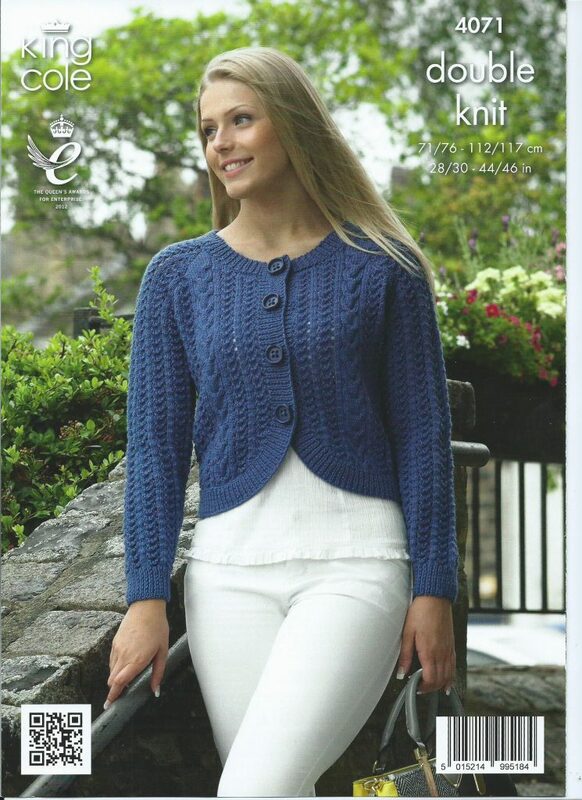 The pattern is simple, based on a 4 row repeat for the back and sleeves, and an 8 row repeat for the two fronts (to include a simple cable). I knitted the back and fronts to the length dictated by the pattern and in hindsight the cardigan is a little longer than I would like. Next time I will shorten by 2 inches. 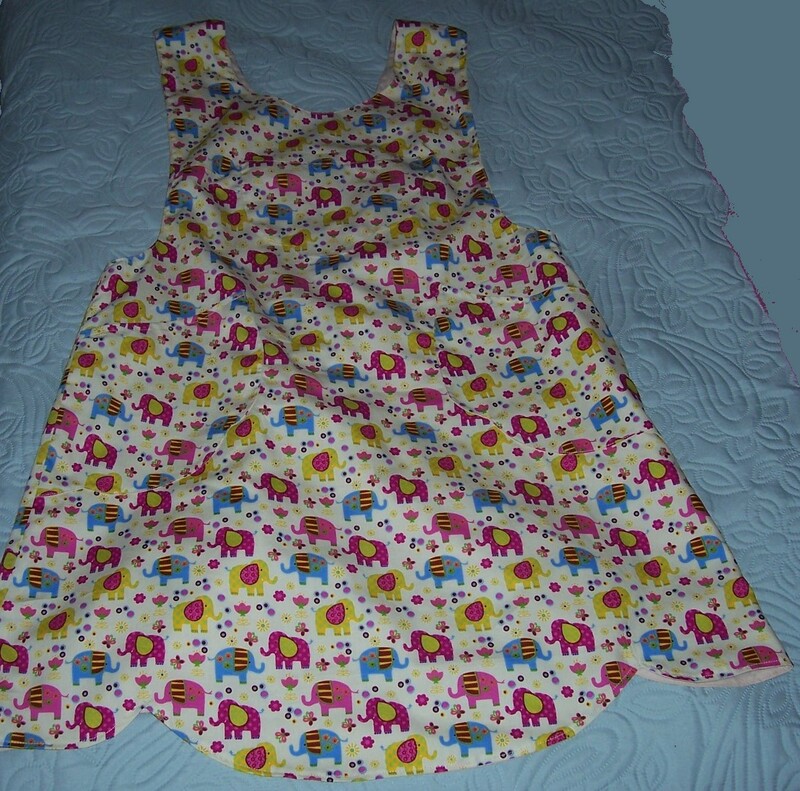 The sleeve shaping was also simple being a raglan design – a favourite of mine as it makes the garment very easy to wear. 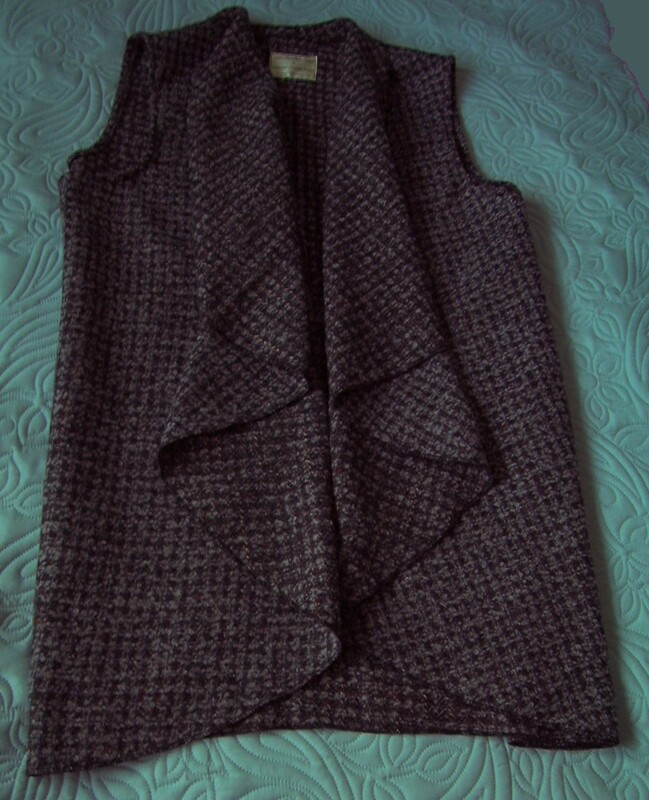 I did notice that once again my arms are shorter than the standard measurement which meant that I did not knit all the additional rows on the sleeves once I had finished the increasing and just before Istarted decreasing for the raglan armhole. All went well until I got to the part where you have to pick up and knit the rib that encircles the front edges and the hem of the bodice. Having first knitted the neckline ribbing, over 200 stitches for the hem band are picked up onto a circular needle from one of the fronts around to the centre back. 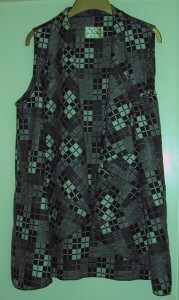 The left side is just plain k1 x p1 rib and the right side has to incorporate the buttonholes. 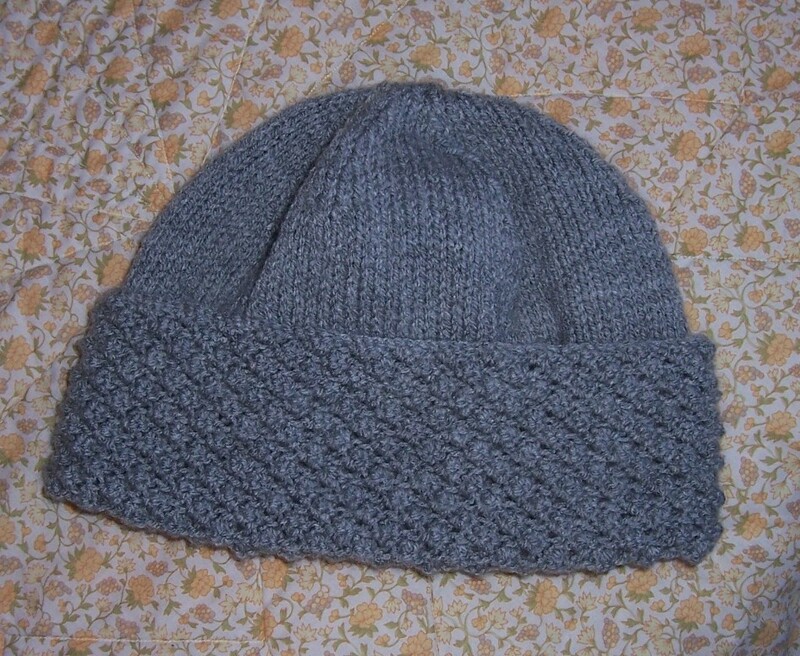 I have never knitted on a circular needle before and this was at times a frustrating experience. 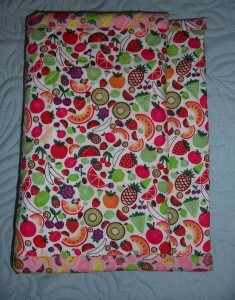 However, now it is done and I am fairly pleased with the result. I am knitting the pattern again. 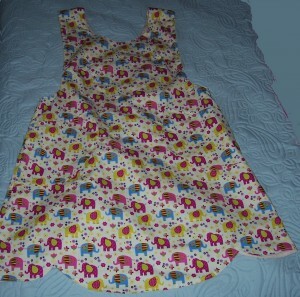 This time I will make the back in a smaller size as the current version is too big across my back. To avoid all that circular knitting I have opted for the straight hem version. 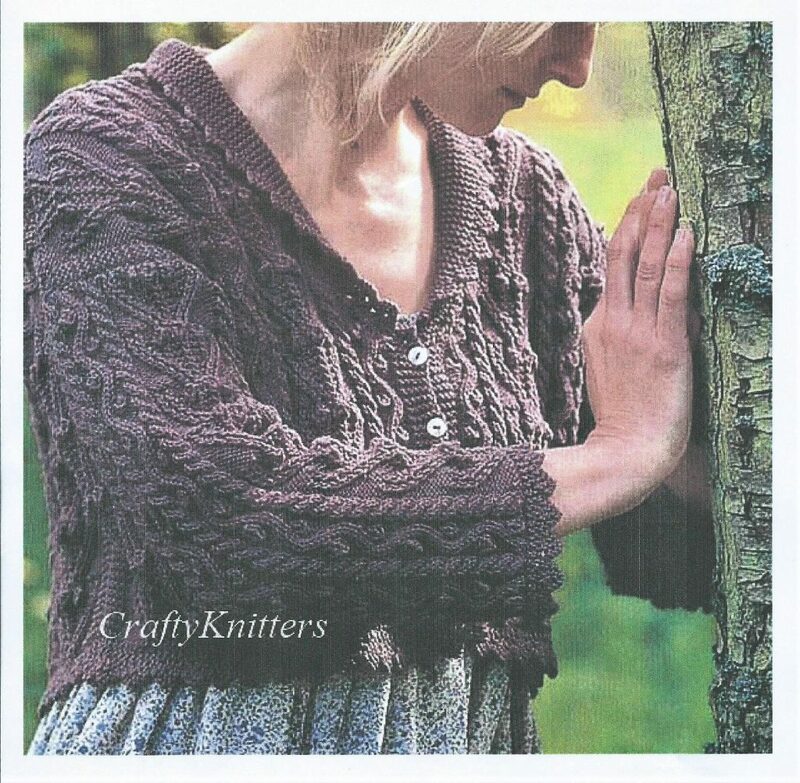 I have already purchased some Lavender-coloured yarn and have started knitting the fronts. Once this version is complete I plan to go onto a much more challenging project which is knitted in 4-ply yarn and will involve a lot more concentration to get the pattern right! Whilst recovering from Hip Replacement surgery I have been catching up on some UFO knitting projects. I purchased 3 hanks (50 grms each) of this lovely Artesano Nebula yarn in Olive Oil colourway from Beaker Button Studio at Weyhill Fairground. This yarn is an Alpaca, Merino, Donegal Blend with little tufts of contrast and is very soft. 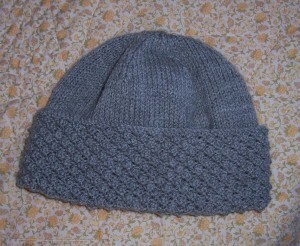 The pattern is from Ravelry and is very simple to knit. Cast on 3 stitches then increase at the end of every other row until you have 100 stitches, then decrease in the same way. To complete the project I had to purchase two additional hanks of yarn which I bought direct from Artesano. To finish the shawl I added some brown tortoiseshell buttons from my stash that I had bought in bulk from eBay. The shawl now measures 60 inches across x 21 inches deep (excluding the button trim) – just right to drape across my shoulders for that little extra warmth. As I said in a previous post, whenever possible I like to hand make gifts for friends and relatives. This year has been a particularly busy one as I made some additional gifts for my new friends at Franklin’s Patchwork & Quilting group. 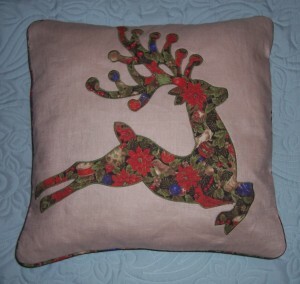 Most of this year’s gifts were either festive scented embroidered cushions, sewing room accessories or tote bags. I tried to match embroidery designs or fabric prints to the personality of the intended recipient so there are subtle prints, exotic prints, redwork and scandi-style, a real “Heinz 57” variety of designs! 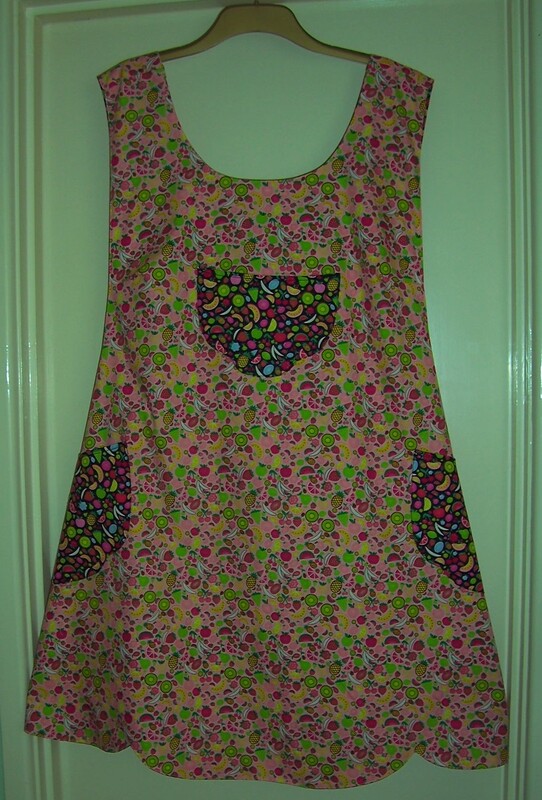 I made a couple of long-line waterfall fronted waistcoats and two fully reversible aprons but apart from that have steered clear of “clothing” to avoid any “size” issues. 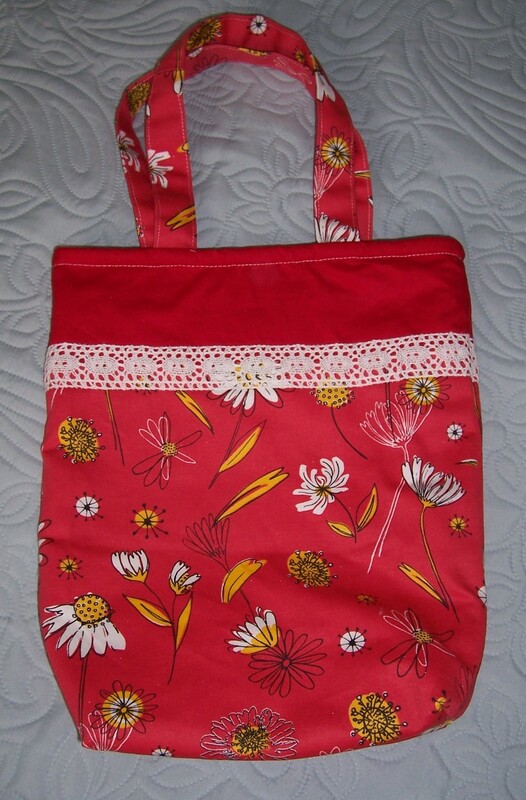 For most of the bags I used cotton fabric purchased from Fabricland and Simplicity pattern 2164 as the basis for the design. 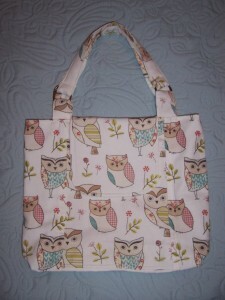 For each bag I changed the dimensions slightly dependent on my fabric choice and length of fabric available. 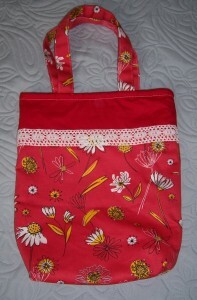 Some bags had internal pockets, some external pockets and a couple NO pockets! I also changed the handles again dependent on fabric availability. All the bags were padded with 2oz polyester wadding which adds an extra layer and enhances the feel of the bag. I will be tutoring a class at New Threads, Weyhill Fair in January 2016 for making this bag and my Christmas gift making has provided me with plenty of practice with the pattern! 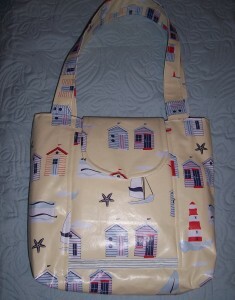 The nautical print bag was made with oilcloth purchased from Fabricland in Salisbury. 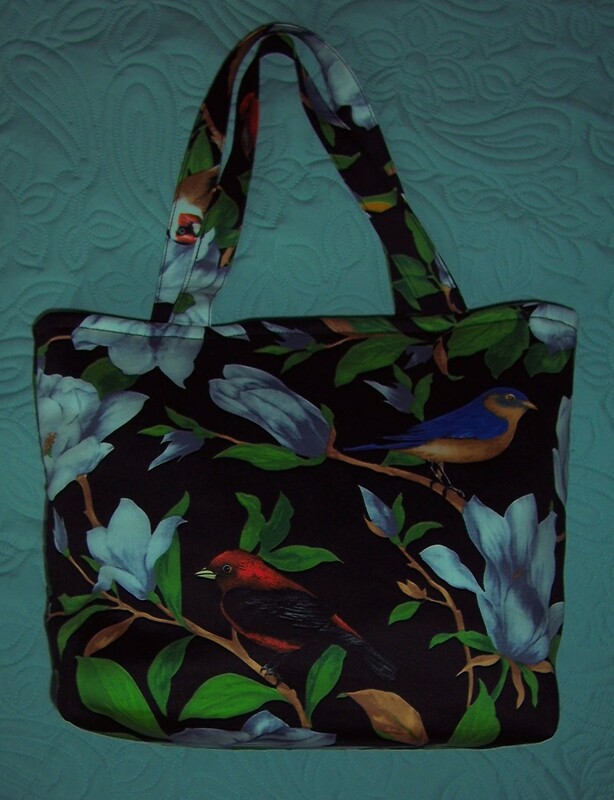 It is the Carousel Carry-All Tote bag design but this time there is no hardware on the handles and I used a strip of velcro for the closure of the flap. 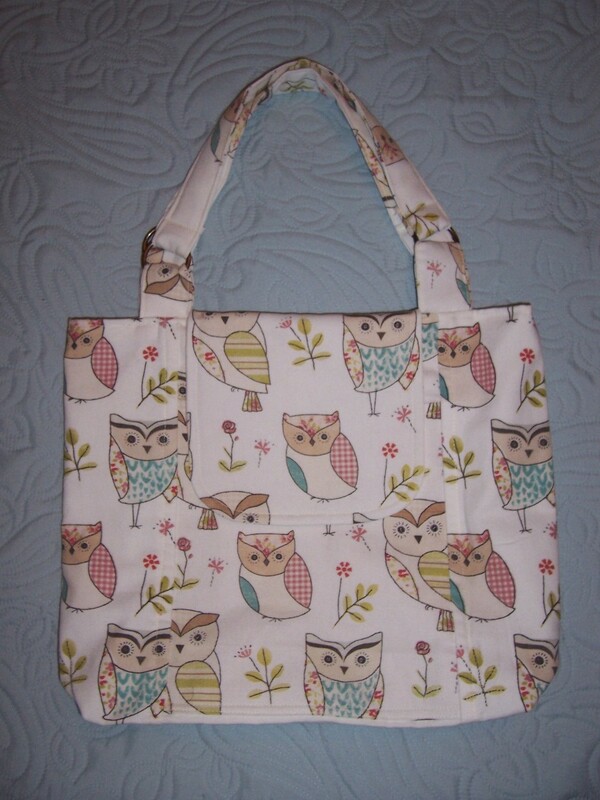 The Linen “Owl” print bag is another Carousel Carry-All tote with Brass “O” ring hardware on the straps which are slightly shorter, and velcro fastening. For sewing accessories I made two Armchair Sewing Rolls using a pattern and instructions devised and developed through Sprat & Winkle Quilters. I owe Lizzie grateful thanks for re-sending the pdf as my original copy has been mislaid. 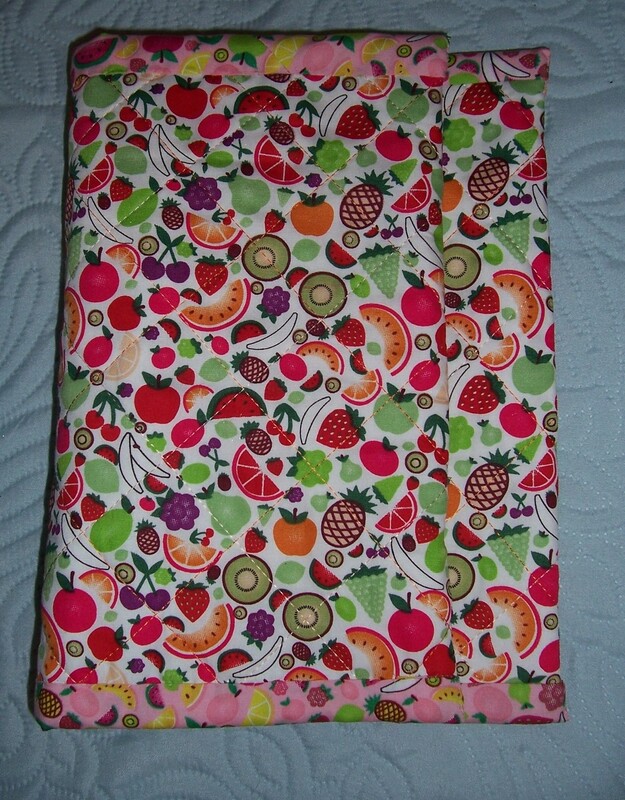 I used Tutti fruitti print cotton fabric in two colourways, purchased from Fabricland plus some plain White polyester cotton from my stash. The pin/needle cushion in the centre of the Sewing Roll was stuffed with polyester toy filling. 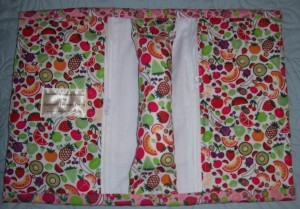 The zips were from a length of continuous zip purchased from Dunelm Mill. Now that I have just about exhausted the supply of zips left by my father who once worked as an Engineer at Opti-lon zip factory I am a convert to continous zips except that as yet I have never managed to apply the zip pulls. For that I usually enlist assistance from one of the members of our P&Q house group! 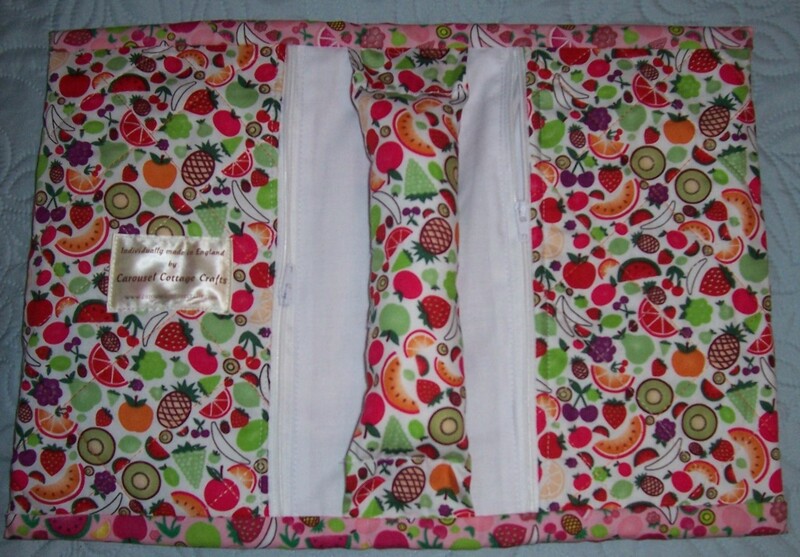 The other sewing room project was a Thread catcher and pin cushion which can be laid on the edge of a sewing table next to your machine. 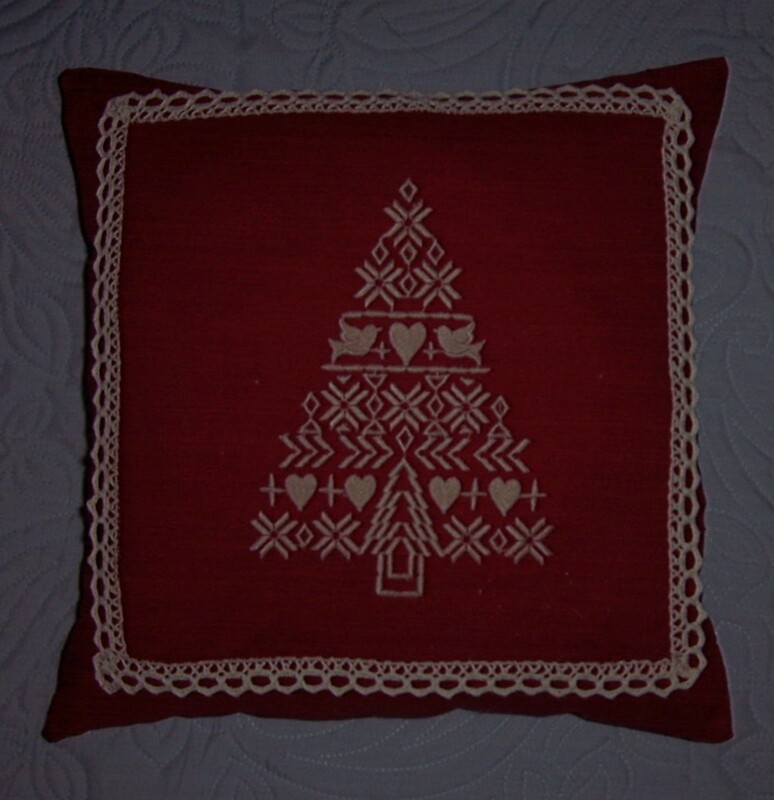 I have had the pattern and instructions for this for many years, source unknown but probably from the internet. The base of the pin cushion is two layers of cardboard from Whiskas cat food cartons. They provide stability and prevent pins and needles from going through to the work surface beneath the pad. 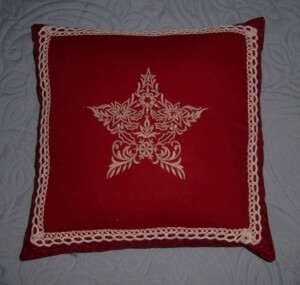 The Fragrant Festive cushions were made using a variety of embroidery designs mostly purchased from www.emblibrary.com. 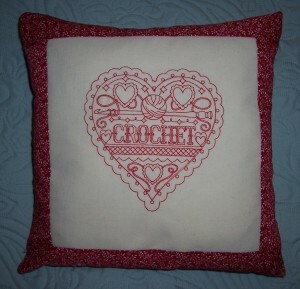 I used Red cotton fabric from New Threads, Weyhill Fairground and either White or Stone coloured thread for the embroidery. The various trimmings were from my stash. 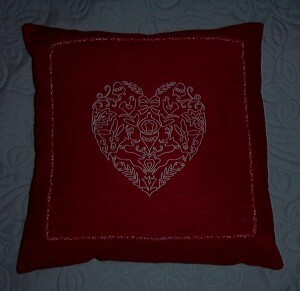 Each cushion measures approximately 14 inches square and has a separate pad made from curtain lining. The pads are filled with polyester toy stuffing. 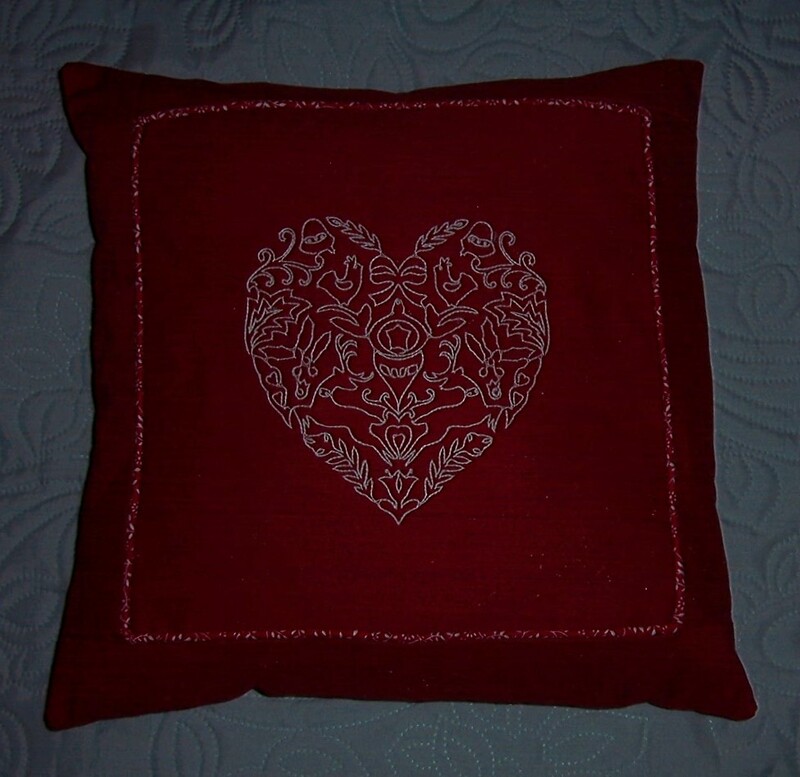 I used a zip with lap insertion on the reverse of the cushions which are made either from more of the Red fabric, or a contrast e.g. 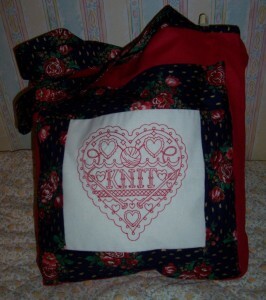 the same fabric as to that used for piping or borders. 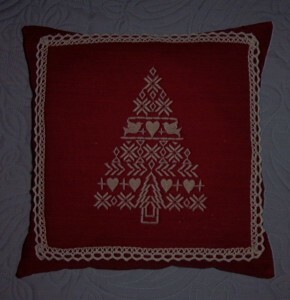 The fragrance is provided by sachets “Christmas” or “Winter” from Greenleaf. 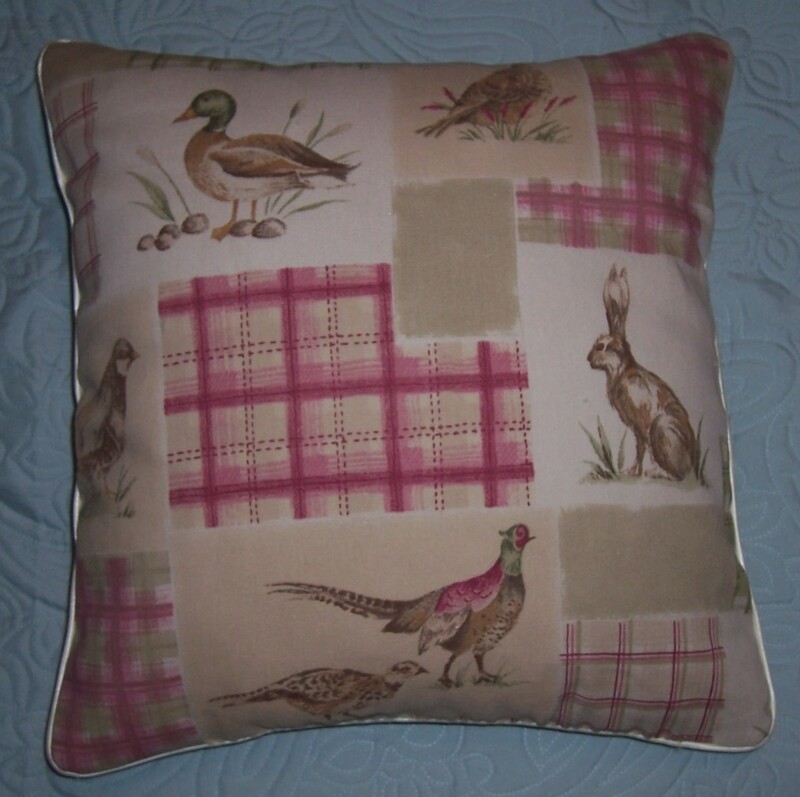 I made one other larger cushion from a fabulous “country wildlife” printed linen purchased from B&R Textiles in Salisbury. 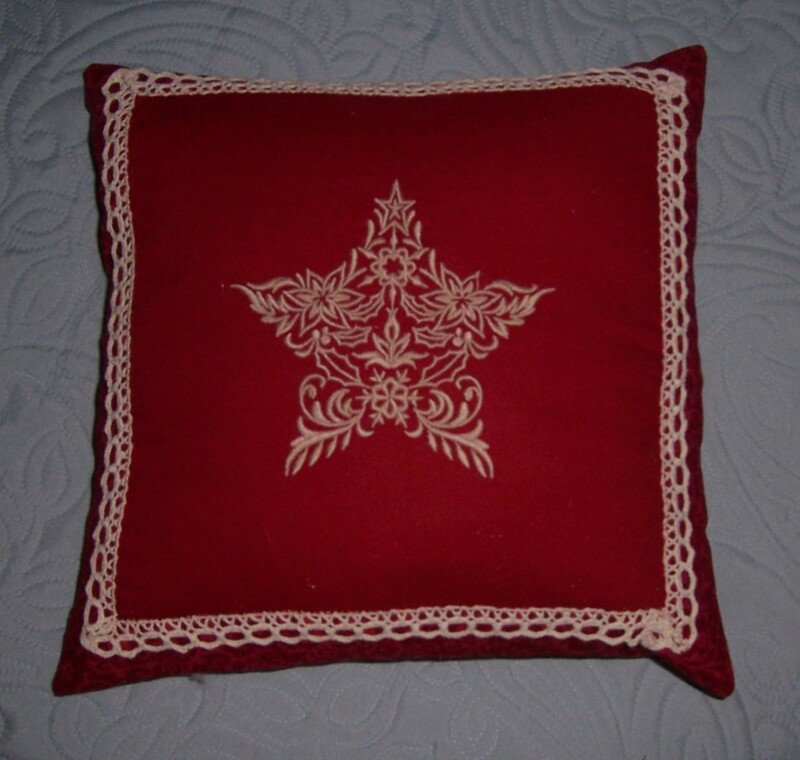 The cushion measures approximately 18” square, has a Cream satin piping and is totally reversible as I hand stitched the opening behind the piping. 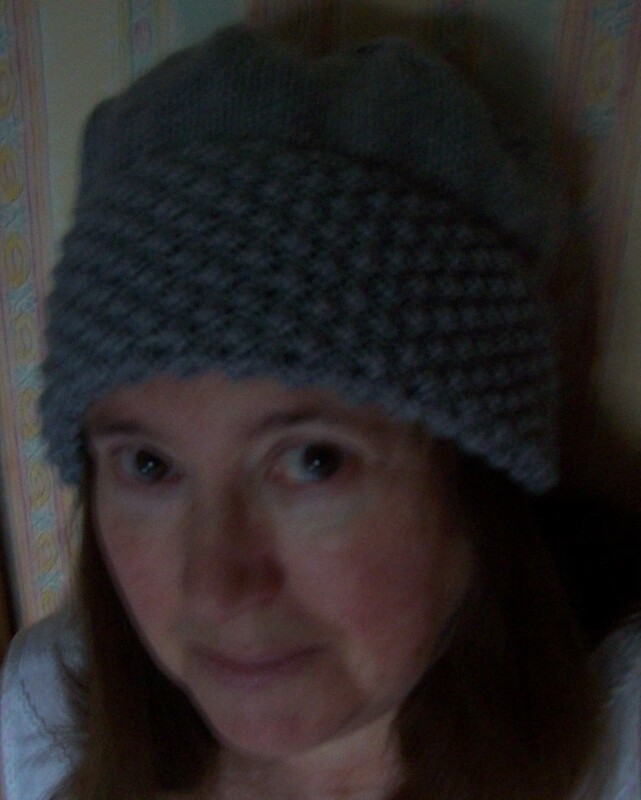 In addition to sewing, I did a little knitting. 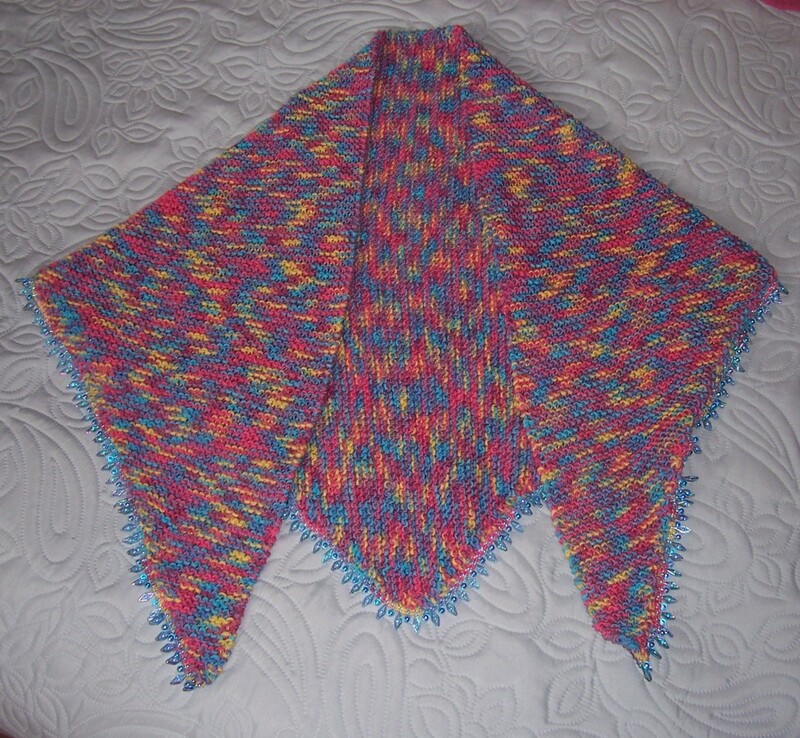 This year not as much as last year when I made an extremely l-o-n-g scarf! 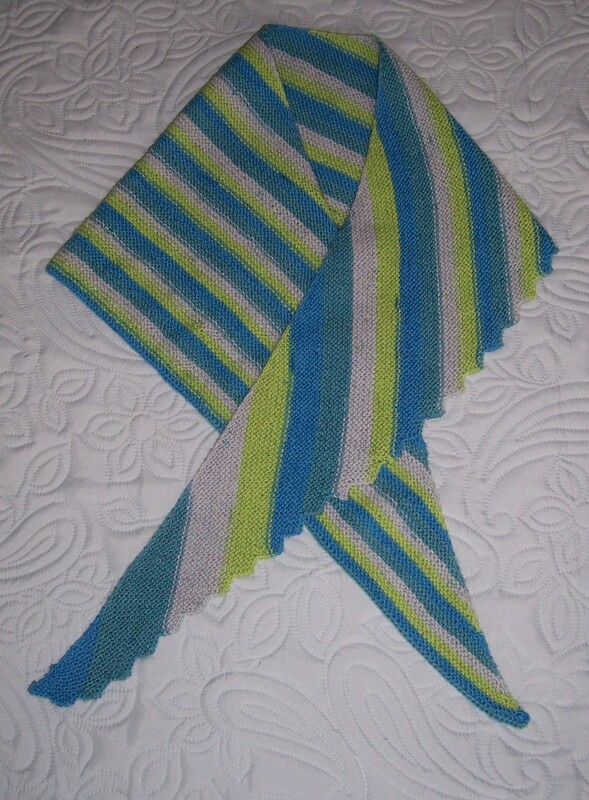 This multi-coloured striped scarf is a pattern from Ravelry.com called “The Hitch hiker Shawlette”. 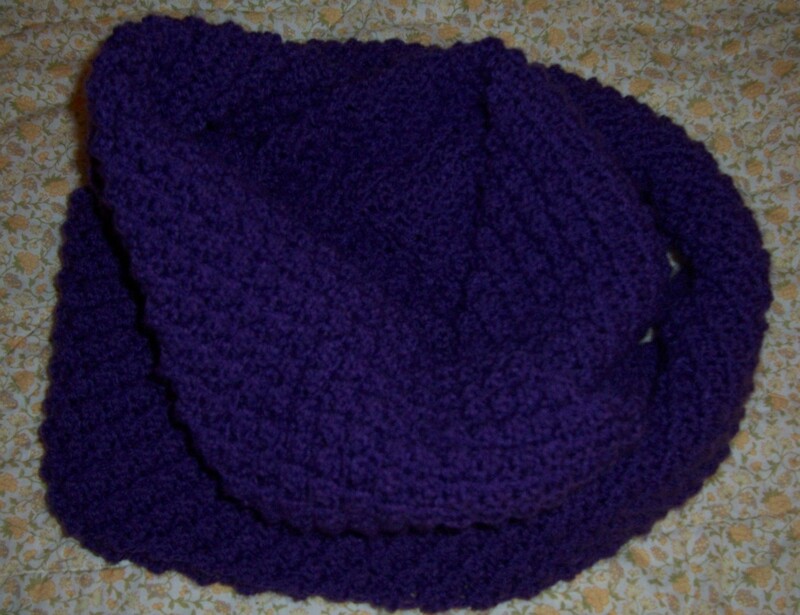 It is made from 100grms of a random-dyed 4-ply sock yarn. 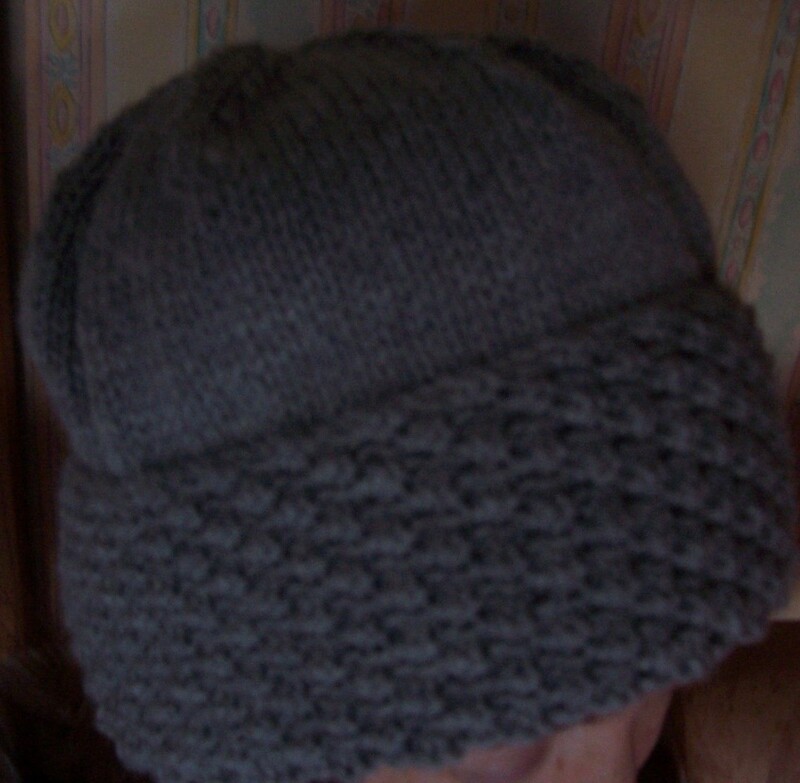 A very simple pattern that I have enjoyed knitting and plan to repeat – next time in “Spring” shades. Finally, at Christmas time last year I designed and part-made a linen cushion featuring an appliqué of a leaping reindeer with a fabulous set of antlers. This year I got around to finishing it! 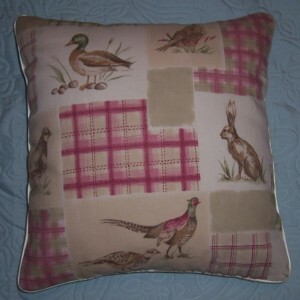 The cushion measures approximately 16 inches square, has a linen front, cotton print piping and reverse with lapped zip closure. I made the pad to fit using polyester toy stuffing but now find it is rather flat so will make another pad and this time, stuff it really firmly! My final project for 2015 is a commission for an embroidered cushion featuring a “chocolate” cocker spaniel. Other than that my next projects will be something completely different – I have many, many ideas and plans so we will just have to wait and see what magic happens in my sewing room. 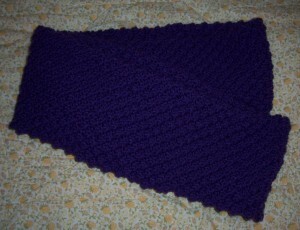 It is only during the colder months of the year that my thoughts turn to knitting. 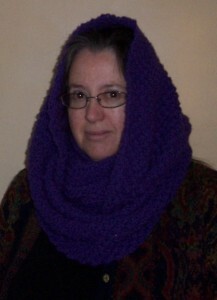 I have a hankering for some lovely, cosy hand-knitted scarves and snoods. I am currently working on two projects. The first is an Advocado Green Alpaca yarn worked in double Moss stitch and the second a Bright Mustard yarn worked in Blackberry stitch. I will post pictures once they are completed. 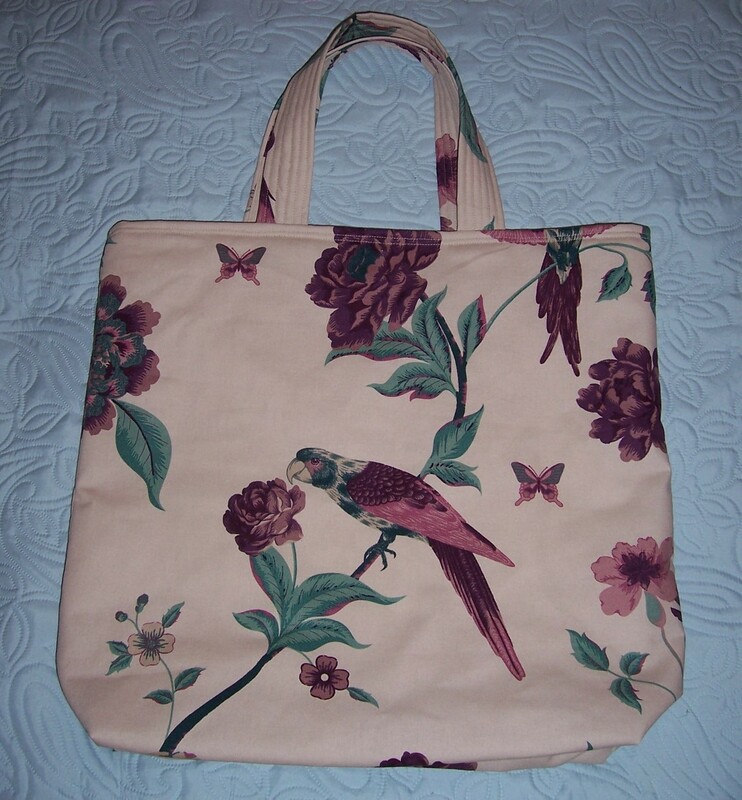 But, I digress, the point of this post is that I have been carrying my knitting around the house in a brown paper bag which has been deteriorating rapidly. 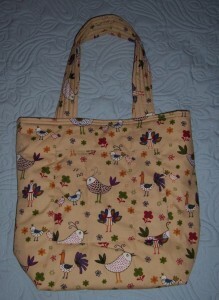 I thought to myself – a bag specifically for my knitting is what I need. 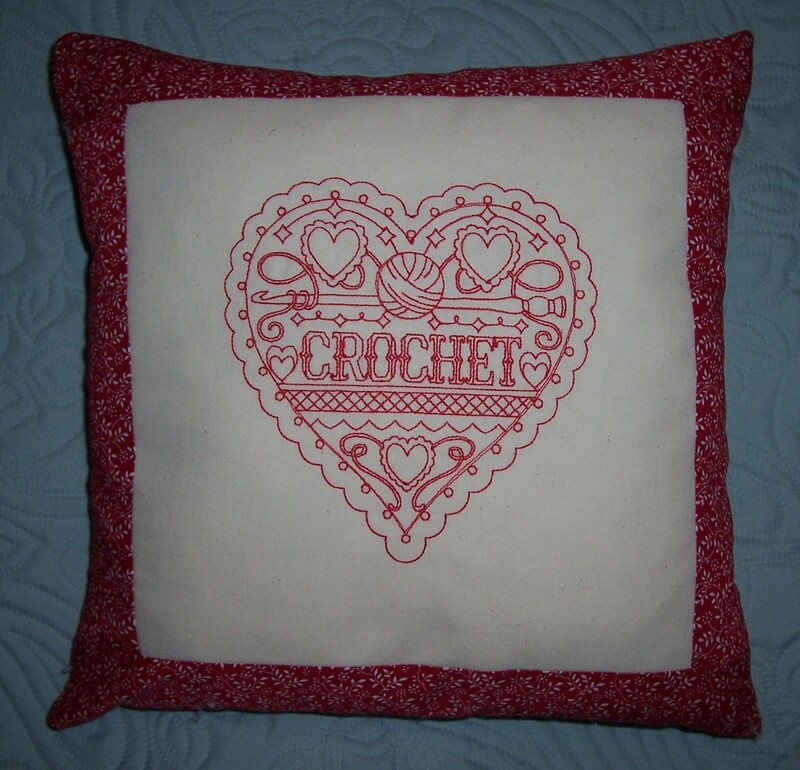 I had already stitched out an embroidery design in Redwork (bought from www.emblibrary.com) that was simply perfect for the project. Today I gathered together some remnants of fabric from my stash and below is the finished result. 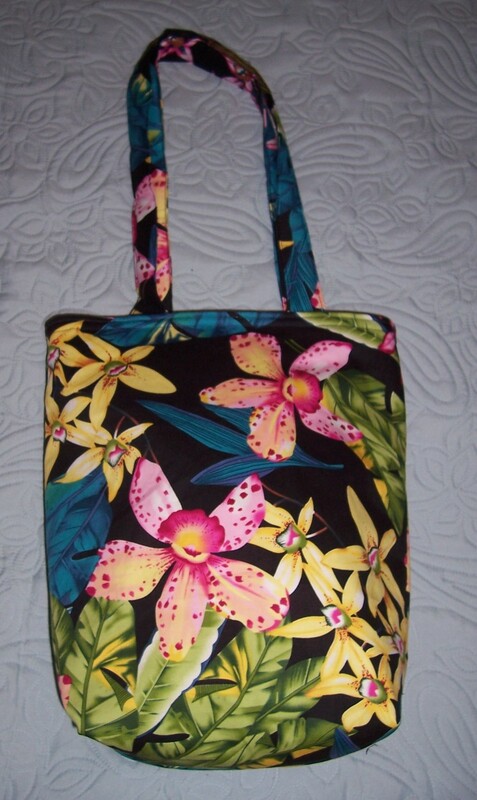 The bag measures approximately 15 ins wide x 16.5 ins deep. 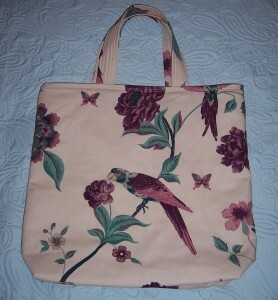 It has carrying handles and I have incorporate a special long narrow pocket into which I can slip my knitting needles. The brown paper carrier bag is no more!